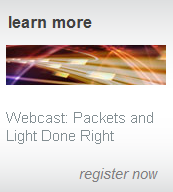 It’s time to rethink everything you know about Ciena’s 6500 Packet Optical Platform. You’ve known the 6500 as our flagship platform for next-gen optical transport, and for good reason. The winner of multiple industry awards over the last few years, the 6500 has been the driving force behind the industry’s coherent optical technology revolution, embedding Ciena WaveLogic technology to enable the wave of 40G and 100G deployments we are seeing around the world. Today, the 6500 becomes much more than that. This morning, Ciena has introduced significant new packet capabilities for the 6500 aimed at directly addressing the incredible growth of business Ethernet services and the inevitable convergence of the packet and optical layers of the network. These new integrated packet-optical capabilities provide very efficient Ethernet aggregation and transport over an optical infrastructure, flattening the network and consolidating equipment needs by allowing Carrier Ethernet edge devices to network directly into the optical infrastructure. This means fewer devices to manage, lower power and space requirements, and faster, more automated turn-up and management of business Ethernet services -- from the network access to the metro core. Today’s new packet capabilities come in two forms: new packet enabled cards for the 6500, and the integration of our packet operating system into the 6500. Ciena’s Service Aware Operating System (SAOS) software is already ubiquitous across Ciena’s entire packet networking portfolio and deployed on more than 300,000 platforms worldwide. By extending SAOS onto the 6500, service providers can now seamlessly provision and manage carrier Ethernet services across our packet and 6500 families – from the network access to the metro core – using our OneControl unified management system. Implementation of those packet service capabilities on the 6500 is enabled via Ciena’s new E-Suite packet modules, and include both blade-based packet switching modules for relatively modest footprint applications and fabric-based packet switching modules for higher density sites and mesh connectivity. Within the E-Suite family, the blade-based packet switching cards, called our eMOTR cards, come in two versions: a dual-slot card optimized for GE services and a single-slot card optimized for 10G services. In addition, a new eSw 4x10G card communicates directly with the central hybrid packet/OTN fabric, and allows co-resident packet and OTN switching in the same 6500 system. The fabric-based Ethernet switch card is available today, with the eMOTR cards available in June. Today’s new packet features further widen the flexibility of the 6500 platform as it continues its evolution from a pure optical transport platform when it was introduced almost a decade ago into what is now the industry’s most flexible packet-optical convergence portfolio. 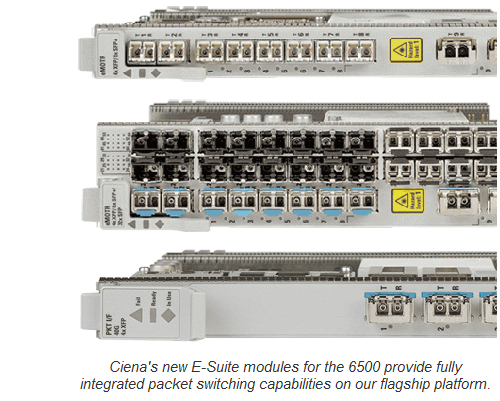 It was less than two years ago that Ciena first announced integration of OTN switching capabilities for the 6500, as well as the extension of Ciena’s OneConnect optical control plane to the family (see Ciena unveils new packet-optical products, enhancements for intelligent infrastructure). With today’s added packet switching capabilities, the transformation of the 6500 is truly complete. And it enables all this across the impressively diverse 6500 family that scales from 2-slot edge to 32-slot core and metro core versions. Of course, the concept of converged packet-optical isn’t necessarily new. The industry has been talking about it for years. What is new is the level of integration and flattening of the network that is now truly possible, especially in metro networks. That leadership in the eyes of our customers couldn’t come at a better time, as the industry’s service providers are now not just hoping for packet-optical convergence, they are expecting to deploy it. In a new survey of global service providers by Infonetics Research, nearly all operators stated their desire to integrate OTN and packet switching in the same platform by 2016. Later this week, I’ll get into some of the more technical details of the new packet switching capabilities of the 6500. Until then, below is a new video on the E-Suite.